Learning for non-employees and remote and distributed employees now accounts for more than half of learning, Brandon Hall research shows, and 40 percent of organizations are charging for this content. Learning—traditionally a cost center—is increasing in value through extended enterprise learning, Brandon Hall Group’s 2017 Extended Enterprise Learning Study reveals. Learning for non-employees and remote and distributed employees now accounts for more than half of learning, the research shows, and 40 percent of organizations are charging for this content, with almost one-third of organizations recouping more than half of their learning management system (LMS) costs. The research also shows further tangible, as well as intangible, benefits from extended enterprise learning that raise learning’s overall value. Extended enterprise audiences are those that reside outside the headquarters or specific locations of an organization. They can include remote or distributed employees, as well as non-employees such as customers, channel partners, distributors, value-add resellers, and franchisees. The study, conducted in February, found that more than half of an organization’s total learning audience is from this extended enterprise. Organizations are reaching out to this extended audience frequently: At least one-quarter of customers, sales teams, and field technical and customer support teams access learning daily or weekly. At least 48 percent of those groups access learning at least monthly. Another sign of just how critical extended enterprise learning has become is the resources organizations dedicate to it. Some 22 percent of companies allocate more than half of their learning budgets to delivering learning externally, and one-third are spending more than 25 percent of their learning budgets on this. Given the large amount of extended enterprise learning that is occurring, it’s remarkable that 56 percent of companies say these efforts are effective or highly effective. This is notable because rarely in our research do more than half of organizations rate other learning efforts (video, mobile, informal, etc.) this effective. The data around budget spending may play a role in this, as organizations put a significant investment into these efforts. 1. Some 40 percent of organizations are generating revenue via extended enterprise learning. Traditionally, learning has been seen as a cost center within the organization. Business leaders see money go in and a lot of intangible, unquantifiable benefits come out. And while Learning leaders recognize the true value of what Learning & Development (L&D) brings to the organization, companies now are able to actually generate revenue with their LMS. The 40 percent of organizations generating revenue from extended enterprise learning represents an 18 percent increase from just less than two years ago. More than half of companies also are recognizing training cost savings from reduced travel costs (54 percent) to reduced overall training costs (58 percent). The recognition of this revenue source could explain the investment numbers, all of which equates to an increased focus on effectiveness and ROI. We see organizations charge for external learning most heavily in the association space, where members pay a fee or a subscription to access content relative to them and their career. According to the research, 14 percent of companies that charge use a subscription model; 48 percent charge by the course or content piece; and 22 percent sell course or content bundles. For the remaining 16 percent, the training is delivered to customers and is recognized as part of the price of products delivered. However they do it, many organizations are reaping the kind of tangible benefits business leaders crave. Almost one-third of organizations are recouping more than half of their LMS costs by charging for extended enterprise learning. In fact, only one-quarter say they are not recovering any LMS costs at all. Recovering learning technology costs is not where it ends. Some 58 percent of companies say extended enterprise learning has reduced their training costs and 54 percent say it has reduced travel costs. Some 40 percent of companies say it has increased sales, which is clearly a tangible revenue gain. There are intangible benefits, as well. Some 55 percent percent of companies say it has improved customer relations, and 41 percent say it helps maximize customer retention. So even beyond the actual revenue generated, the practice of delivering learning externally to where it is needed can result in costs savings and other gains, which further diminish the perception of learning as a cost center. 2. Some 56 percent of organizations find their extended enterprise learning efforts to be effective or highly effective. Very often in our research, organizations give low ratings to the effectiveness of their learning. When it comes to extended enterprise learning, however, companies believe they have the hang of it. Some 56 percent percent of companies say their extended enterprise learning efforts are effective or very effective. Consider that in our 2016 Learning Strategy Study just 43 percent of companies said that their overall learning and development efforts were above average in effectiveness (a 30 percent difference). Only 3 percent of organizations say their extended enterprise learning is not effective at all. What makes this aspect of learning and development more effective than so many others? It is reasonable to surmise that a big factor is that extended enterprise learning is so closely tied to measurable business outcomes. For example, it often involves direct outreach to customers. This can have a huge impact on customer retention and net promoter scores. There is also no escaping the link to sales outcomes. Delivering learning to remote sales teams, resellers, franchisees, etc., has a direct impact on the bottom line—sales numbers and revenue. Lastly, there is the fact that so many companies generate revenue directly from the sale of extended enterprise learning. But how are companies assessing their effectiveness? The majority use surveys sent out to the learners to gain insight into how well their programs are performing, with almost as many using other kinds of assessments. 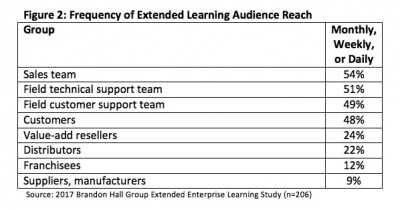 Again, tied back to the importance of extended enterprise learning’s success, it is critical companies understand how people are using it and whether it is working. Very few organizations have a formal set of key performance indicators (KPIs) they use to measure the extended enterprise learning efforts, but that is understandable. In many instances, the learning is being delivered to other organizations with their own KPIs, or to customers, with no real connection to a key performance indicator. In those cases, surveys and assessments typically suffice. However, more than a quarter of companies say they have no formal process at all. Given the amount of spending involved, having no way to assess effectiveness creates a significant challenge to determining ROI. Not having a formal process does not necessarily indicate there is no process, however. Technology has a significant impact on how effective companies say their extended enterprise learning efforts are. Some 79 percent of organizations say technology has a high or moderate impact on the effectiveness of extended learning. 3. Reporting/analytics and mobile capabilities are the most important technological capabilities for extended enterprise delivery. When it comes to the technology to support extended enterprise learning, there are several capabilities the majority of organizations say are important. The capability cited most often is reporting and analytics. It is critical that companies can measure what is happening with learning outside of the organization, especially since it may be more difficult to execute than internal tracking. The next most important function is the ability to deliver the learning to mobile devices. Reporting is always a key requirement for organizations using an LMS, regardless of whether they do extended enterprise learning. It has been one of the top three LMS requirements for the last four editions of Brandon Hall Group’s LMS Trends survey. Being able to track and measure how extended enterprise learning is being consumed is a critical step in ensuring ROI. The need for mobile capabilities is also important as organizations are reaching out to widely dispersed, mobile audiences. If the external audience is sales-focused, companies want to be able to deliver just-in-time information to the learners when and where they need it. Organizations also cannot be sure exactly when their audiences will access the learning, so there is a need to make it available in ways that are convenient to the learners. A majority of companies also are looking specifically for cloud-based platforms, rather than delivering via a system installed behind their firewalls. Given that extended enterprise audiences exist outside the confines of the organization’s infrastructure, this type of delivery system becomes even more important. Companies also want to create multiple portals, so that each audience to which they deliver can have a branded, relevant experience rather than a one-size-fits-all platform. David Wentworth is principal learning analyst for Brandon Hall Group, an independent research and analyst firm specializing in human capital management. Practices include Learning & Development, Talent Management, Talent Acquisition, Leadership Development, and Workforce Management/HR.